Jagarnath is an Ayurvedic student, a self-taught palmist, Om Chanting Leader and Simply Meditation Teacher. He lives in the city of Durban, South Africa and by profession he is a B.com Acc graduate and is currently the Financial Manager for the Aryan Benevolent Homes in South Africa. Apart from all of the above, he is the humblest individual with the purest of intention of wanting his knowledge and expertise to be shared with all that he is able to come into contact with. From his passion to empower and guide youth, he now proudly launches his book Real Secrets Of Life, designed with great belief that if this book is applied by our youth and many adults it would have a significant positive impact on our lives. This will lead to further positive transformation, more peace and love manifesting within ourselves, our community, Country and the World. Krishna is committed to his vision for the world and encourages all leaders to sign a peace pledge and commit to bring upon the change to our world leading by example from his heightened spiritual experiences and teachings of his Spiritual Master and Atma Kriya. History through the ages has always taught us that the best remedies for any kind of aches, sickness or any other alteration in the body and mind, is always the natural way using herbal medicines, remedies and the good old fashioned solution of silencing the mind, relaxing and focusing on your condition from within. 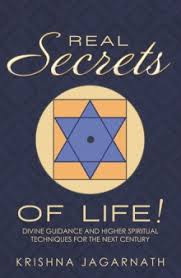 Real Secrets Of Life has accessible and inspiring text based on integrative medicine and the triangle of good health—nutritional, physical, and emotional balance and well-being, The book combines nutritional medicine, Ayurveda approaches, and relaxation and stress-relief techniques to give the best possible advice and healthy guidelines to build reserves and treat specific conditions. Krishna’s vision is to one day see that people and children in every country will learn and apply the tools and techniques given in his book in order to live a more holistic life and deepen their own faith in the divine.